The Beatles' First Appearance on "The Ed Sullivan Show"
On Feb. 9, 1964, The Beatles made their first live U.S. television appearance. More than 70 million Americans gathered around their televisions to watch four young men from Liverpool make history. 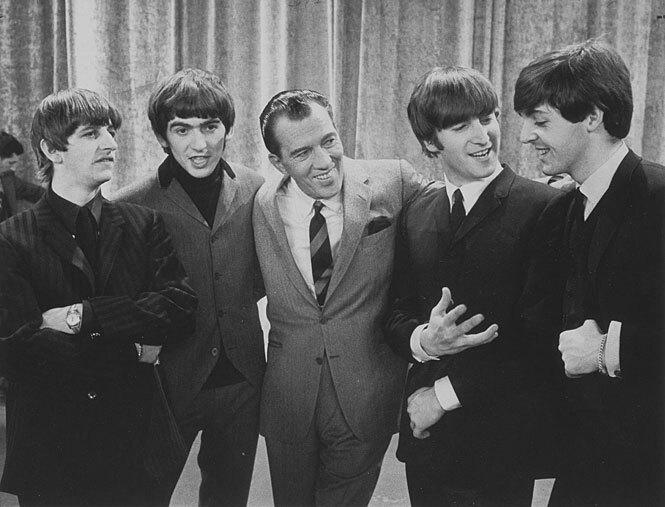 Ed Sullivan, the “king of Sunday night television,” booked The Beatles for three appearances after seeing the response of fans during a visit to London. Before their debut on the show, The Beatles’ record “I Want to Hold Your Hand” was leaked to radio stations across the country. By Jan. 10, 1964, the album had sold more than 1 million units and “I Want to Hold Your Hand” was the No. 1 song on the Billboard charts. Taken during the rehearsal for The Beatles’ live U.S. television debut on "The Ed Sullivan Show," this photograph captures the Fab Four on the eve of a landmark moment in American pop culture history. Following the appearance on "The Ed Sullivan Show," the phenomenon of Beatlemania swept the country. John, Paul, George and Ringo secured their place in American hearts and spurred an invasion of British rock ’n’ roll that altered the face of popular music in the U.S. This item is one of 137 million artifacts, works of art and specimens in the Smithsonian’s collection. It is not currently on display.